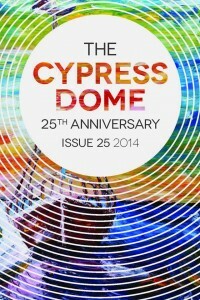 The Cypress Dome accepts literary writing and visual art of many types. Submissions to The Cypress Dome 2019 issue is open to all UCF students, undergraduate or graduate, enrolled full- or part-time during any semester of the 2018–2019 academic year. Visual Art — maximum 5 pieces of artwork; we accept drawings, paintings, photographs, digital art, sculptures, and other visual work, please note the medium in your cover letter. If selected, the art must be a minimum of 300 DPI. Final decisions on all work regardless of submission period will be made in the Spring when all submissions have been reviewed. Responses are usually sent by the beginning of April. Include your name, address, phone number, UCF email address (and an email you check regularly, if those are not the same), academic status (graduate or undergraduate), in addition to the title(s) of submissions, submission category, number of words/lines per submission (if applicable) or medium of the work (visual art only). Copy and paste your Cover Letter into the box on the Submission Page. All submissions must be made at Submittable (https://cypressdomelitmag.submittable.com/submit). All work will be reviewed by the editors, evaluated according to artistic merit, and then accepted or denied. All submissions are blind reviews; editors do not know who the authors or artists are when reviewing submissions. Authors selected for publication will be asked to present an electronic copy of their work in Microsoft Word if not already supplied. Be patient while awaiting our response, final responses are usually sent by the beginning of April. Awards are given for the best submissions in each category. The Cypress Dome editors will select the winning entries. A celebratory reading will be held upon the release of the magazine in late April 2016. For more information please contact us at cdome@ucf.edu or the faculty advisor at laurie.uttich@ucf.edu. Editors will be available to answer any questions in person by appointment. Please understand that we cannot discuss any of your pieces during the submission process, nor can we accept any cash, food, or small animals as gifts—your submissions are the only form of bribe we need.